The Novotel Bourges is a modern, mid-scale hotel with comfortable bedrooms sleeping four and a relaxing swimming pool. 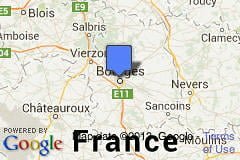 The Novotel Bourges is a comfortable, four-star hotel in the suburbs of the historic city Bourges in France Centre. The Novotel is thoroughly modern but a great choice when needing a well-maintained hotel without any surprises. Rooms can accommodate families of up to four with children under 16 sleeping and eating breakfast for free. The Novotel Bourges has a relaxing outdoor swimming pool and free wifi throughout the hotel. The Novotel is next to the highway making it a popular stopover hotel on longer journeys but an easy drive to the old town of Bourges too – it has a UNESCO-listed cathedral and with the Palais Jacques Coeur one of the most important flamboyant Gothic secular buildings in France. 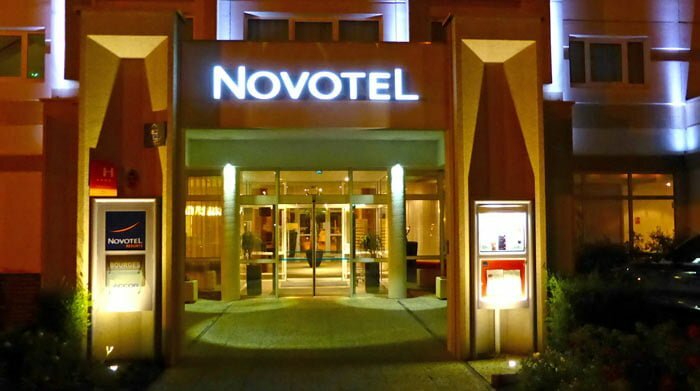 The Novotel Bourges hotel is a modern, four-star hotel in the outskirts of Bourges. The hotel may be short on character but it is very comfortable with full hotel service. Like other Novotel hotels, the focus is mainly on business travelers – this assures good and well-maintained facilities. However, on weekends and during summer vacations, the hotel is also popular with families and other leisure travelers who enjoy the four-bed rooms, convenient location near the autoroute, and often fantastic bargain deals. The Novotel Bourges has the usual range of entertainment for children including an Xbox, books and games. A computer for guest use in the lobby is linked to fast Internet and a free printer. (Free wifi is available throughout the hotel.) The outdoor swimming pool is reasonably big and remarkably is up to 2.6 m deep. The restaurant serves the standard Novotel menu, which changes every few months. It is generally OK but not particularly inventive – at an in-town location guests would more likely dine out. The breakfast is a decent spread and fair value for big eaters at €15 and a bargain for families where children under 16 eat for free. On busy weekends, a separate breakfast room is open for families with small children. Breakfast is often offered for free or at a vastly reduced rate if booked and paid in advance. 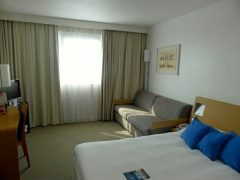 Bedrooms in the Novotel Bourges are fairly spacious with many having foldout sofa beds. These make the rooms suitable for families of four – children will appreciate that the sofa folds out as two separate beds. Bathrooms are modern and well lit. Sufficient toiletries and towels are supplied for a family of four, with additional swimming pool towels at the front desk. As with many other Novotel hotels, the toilet is separate from the main bathroom but without an own washing basin. The walk-in shower is similarly more pleasant than a showerhead over the bath. Bedrooms have a small bar fridge, kettle with coffee and tea supplies, and an in-room safe. Free wifi is available throughout the hotel and although not particularly fast fully sufficient for checking emails or simple websites. From the old town, the Novotel Bourges is a located 7 km to the southwest – a simple 15-minute drive towards Châteauroux. Public transportation other than taxis is not convenient. The hotel is directly next to the Autoroute A71 (Exit 7). This allow for easy late night arrival / early morning departure for travelers en route to holiday destinations in the south of France. In summer and on weekends, the hotel seems very popular with northern European travelers en route to and from other regions of France. The Novotel is perfectly suited for such stopovers but old town Bourges is worth visiting too. The Gothic Cathedral of St Sebastian is inscribed on the UNESCO World Cultural Heritage list while the Palais Jacques Coeur is a prime example of secular flamboyant Gothic architecture.